The keytar during “Starship Trooper”. 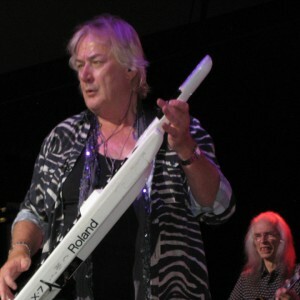 Yes keyboardist Geoff Downes (also of The Buggles, Asia, Icon, The New Dance Orchestra, DBA, etc.) was easily the friendliest and most outgoing member of the band. Downes actually initiated the conversation with me. “Hi guy. Did you enjoy the show?” I told him I did very much. 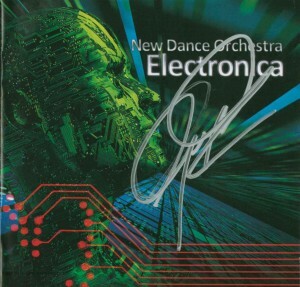 I then presented him with the CD of one of his MANY side projects The New Dance Orchestra’s Electronica. He laughed and said, “Oh, so you’ve got this one then?” I told him that I like to keep current with all his projects. “I appreciate that,” he said. AND he shook my hand! I would have loved to spend more time with him, but suddenly he was pressed from all sides, and I took off – not wanting to get crushed in the shuffle.